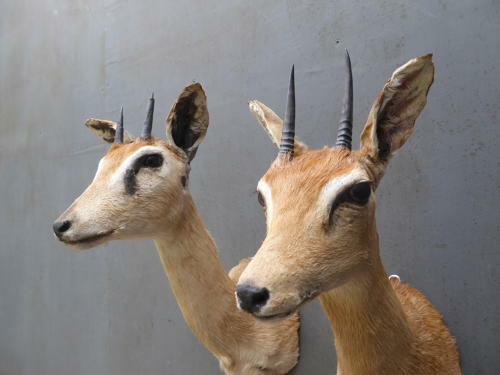 A beautiful pair of taxidermy Oribi heads. A stunning pair, of male Oribi (Ourebia ourebia) shoulder mounts, extremely well executed & with a wonderful look about them. Perfect for symmetrical decorative ideas & very unusual to come across a matching pair like this! Very good original condition with a very light historic repaired crack to the rear of one ear & some naturally occuring wear / light damage to the outer horns on one mount. Neither detracts in the slightest, excellent overall.